Oil -- there’s no escaping the fact that it’s at the heart of modern life, powering the world to previously unimaginable heights. But one day that will end. Called “scorchingly ambitious,” (The Guardian), the innovative drama Oil traces the life of this transformative resource, from its first boom in 1889 to its inevitable demise in the not-too-distant-future -- all seen through the eyes of a single mother and her daughter. Across five separate but connected playlets, the duo spans the globe and decades, struggling to survive by any means necessary. Ella Hickson, a young playwright making waves in the U.K., tackles big ideas of feminism, imperialism and environmentalism in this genre-busting tale that makes its American premiere at Olney Theatre Center. "...The vision of British playwright Ella Hickson's novelistic drama "Oil" is dazzling. In five chapters, the story sweeps from 1889 to the mid-21st century, pretty much exhausting the petrochemical age. That's daring enough, yet the astonishing thing is how Hickson spins this epic political tale in the context of a gripping mother-daughter story." "...Sometimes no matter how carefully the pot gets stirred, ingredients just don't coalesce into a fully pleasing whole. That's the case with Tracy Brigden's staging of Ella Hickson's Oil at Olney Theatre. Or perhaps it's an issue with Hickson's play." "...To say this play is complex is an understatement. It may not be for everyone. But I applaud Olney for attempting to bring it to American audiences. Director Tracy Brigden does a yeoman's task in pulling this altogether. The ensemble cast is terrific. The sound is so realistic I thought cars, engines, planes were all in the theater. Thanks to Sound Designer Kenny Neal. Kudos to Scenic Designer Luciana Stecconi, and Costume Designers Michael Krass and Robert Croghan." "...No one can say the Olney Theatre Center in suburban Maryland doesn't take chances. 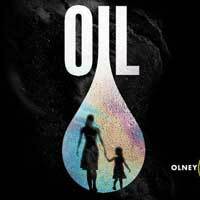 Its current production, Oil, is an epic that grounds the world's love affair with petroleum in the experiences of a single mother and daughter, told in the confines of the Mulitz-Gudelsky Theater Lab; it's very good in places but unwieldy and not always easy to follow as a whole." "...There are a few shows - very few - which on first viewing have left me breathless. The original productions of Sweeney Todd and Copenhagen come quickly to mind. To this small list add the American premiere of British playwright Ella Hickson's Oil at the Olney Theatre Center." "...For those who love provocative and artfully done theatre, "Oil" is a must-see show. Don't let it slip away before you get your ticket." "...The play shifts almost twenty years later to Tehran and challenges our ears further as it takes us into the clubby atmosphere of British colonialism with its clipped accents and imported cultural norms. "May," that pregnant wife, has somehow found her way with her daughter, working as a maid in the new desert landscape. How she got there is not quite clear (or indeed if it is the same woman), but we think she abandoned her husband to escape the life-threatening circumstances of rural poverty, cruelty, and boxed-in threat to her identity."